This week’s First Dibs Offer is for my ritually crafted and blended, Full Moon and Dark Moon Bath Salts. 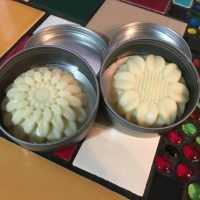 4 ounces of skin softening, scented magick for your bath. 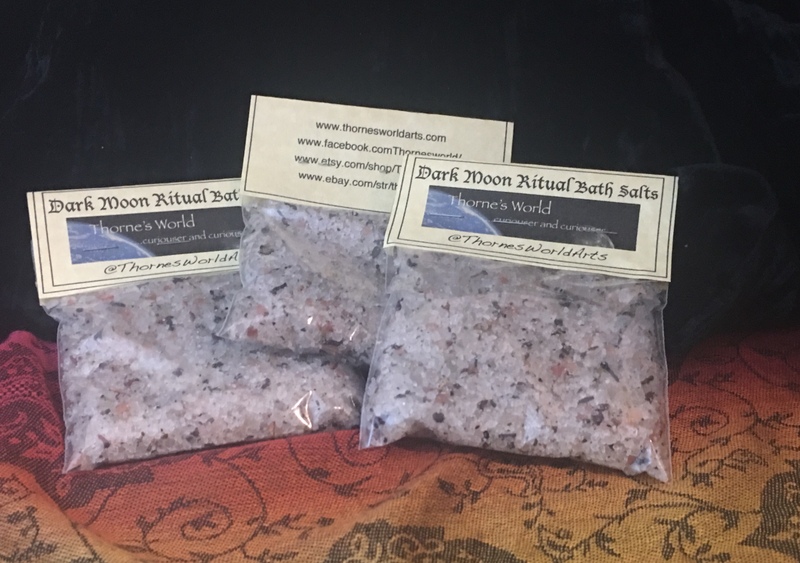 Luxuriate in my blend of 3 Solar dried Pacific Sea Salt, Pink Himalayan Salt and Epsom Salts. 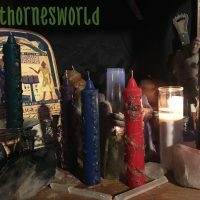 As always they ritually crafted and are composed of 9 herbs and oils, each chosen to honor and vibrate with the Full Moon or Dark Moon energy. They do have a couple of herbs in common, being both of the moon, but then they diverge in light and shadow. 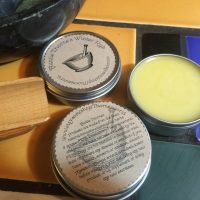 You will find the Full Moon scent a bit sweeter and lighter than that of the Dark Moon blend, which while still sweet, carries the musky undertones of the dark. If you’ve made it this far, stay with me a moment longer. I have a page and a group, over on Facebook. My page is, of course, Thornesworld. My group, is Thornesworld First Dibs Group. The group is just what it sounds like. 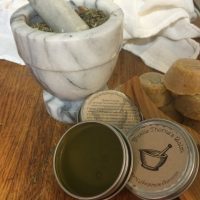 I offer weekly (usually) hand crafted magickal items there at a small discount or with free US shipping, before I list them in my shops. So members get First Dibs. 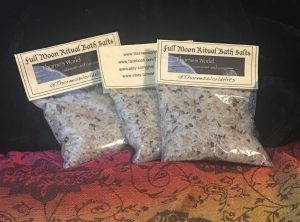 Each 4 ounce bag comes to my first dibs friends for only $7 with free US shipping, or choose one of each for only $13. But here’s the deal. It’s only available through my First Dibs Facebook group. So if you want in on this deal, head over to my Facebook Page, Thornesworld, and give me a “LIKE”. Then, either click on the “Visit Group” button, or go to Thornesworld First Dibs Group and join. You’ll find this offer near the top of the feed. Thanks! 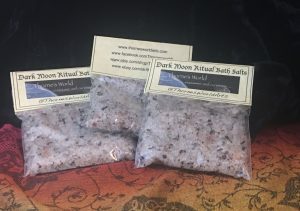 This entry was posted in First Dibs Friday, Herbs, Magickal Craft, Magickal Living, Moon Magick and tagged bath, bath salts, dark moon, essential oils, full moon, herbal magick, herbs, hermetic, magick, magickal bath, magickal lifestyle, magickal living, new moon, pagan, ritual, ritual bath, witchcraft. Bookmark the permalink.